Patchwork By Paula- Specializing in T-shirt/Memory Quilts. This past weekend at the Mid-Atlantic Quilt Festival in Hampton, VA, our roving reporter, Jackie O'Brien was hard at work in the Studio 180 Design Booth. If you were there, most likely you couldn't miss her bubbly personality and infectious laugh! While there, Jackie was able to catch up with a friend. 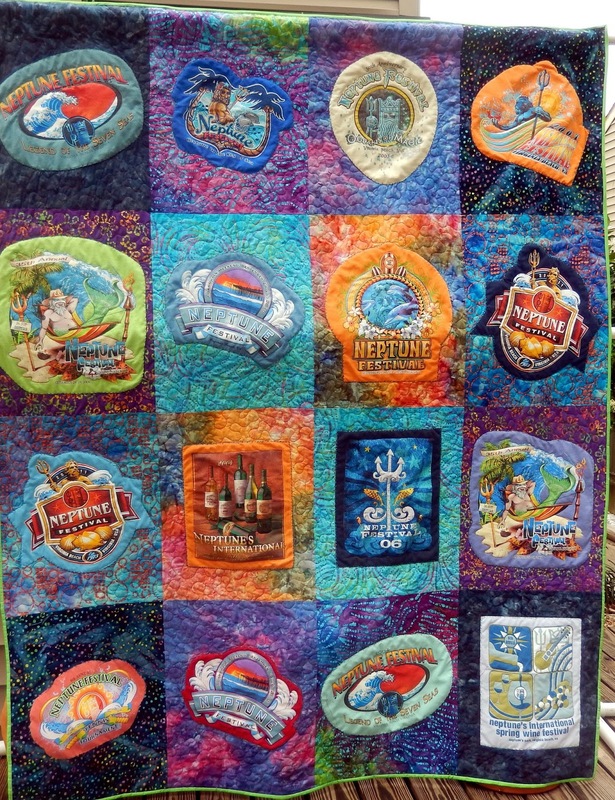 In this blog, she shares her friendship with Paula Harr and some of her quilting accomplishments. I met Paula Harr about 5 years ago through the Tidewater Quilt Guild in Virginia Beach, VA. I liked her immediately. She has a wicked sense of humor and a sparkle in her eyes that can light up a room. Paula was raised by her grandmother and as a child played under the quilt frame as quilts were made by hand. Paula has been quilting since the 1980’s. She owned a quilt shop in Fairmont, West Virginia called “Uncle Bertie’s”! I asked questioningly “Uncle Bertie’s”???? Paula replied that for some unknown reason her children called their Great Grandmother “Uncle Bertie” and there you have it! Paula was a Psychiatric Nurse for 47 years; I think that explains the twinkle in her eyes! She retired on a Friday the 13th in 2014 just for luck! 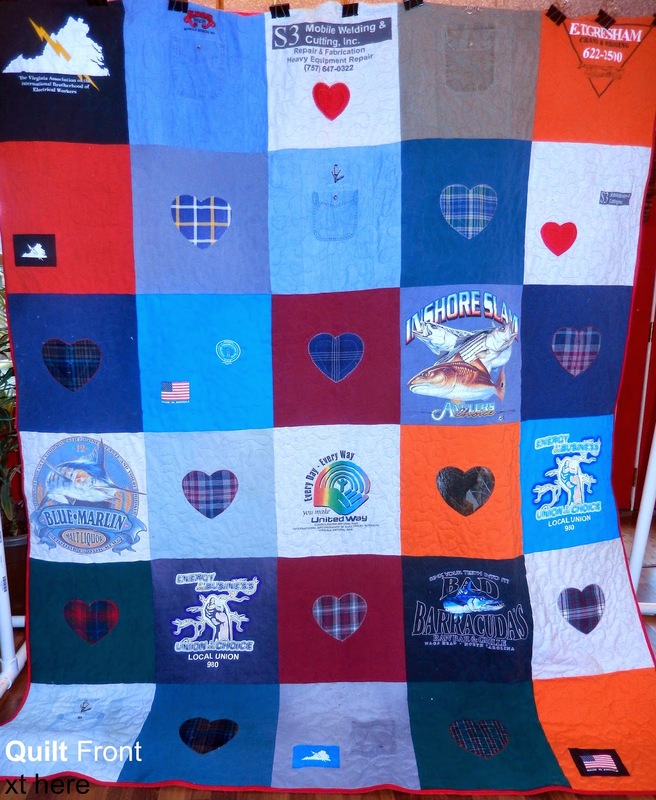 Several years ago, Paula was approached by the Neptune Festival Committee in Virginia Beach, and asked if she would make them a T-shirt quilt to raffle as a fund raiser in exchange for a free booth at the fair. She said yes and a new business was born. Below is the gorgeous quilt she made for the festival. The Neptune quilt was fabulous, and Paula enjoyed making it. I say that because for anyone who has made a T-Shirt quilt and you ask if they will make another, usually the answer is a resounding “NO”! But, Paula began answering “yes” to those who wanted a T-Shirt quilt made for them. Paula only uses Quilters Dream Batting when making her quilts. Her favorite is the Select Loft (Mid-loft) for all its versatility.